Benefits Review Board - The Department of Labor's Benefits Benefits Review Board was created in 1972, by Congress, to review and issue decisions on appeals of worker's compensation claims arising under the Longshore and Harbor Worker's Compensation Act and the Black Lung Benefits amendments to the Federal Coal Mine Health and Safety Act of 1969. California Department of Boating and Waterways - Programs include funding and designing the construction and improvement of boating facilities, beach erosion control, aqautic weed control, boating safety education, Clean Vessel Act grants, and training local boating law enforcement officers. California Office of Spill Prevention and Response - Agency responsible in California for preventing, preparing for, and responding to spills of oil and other deleterious materials. Chief Administrative Law Judge for the U.S. Coast Guard - Index and text of all commandments on appeal. Commercial Diving - Commercial diving information provided by the Occupational Health and Safety Administration (OSHA) web site. Federal Maritime Commission (FMC) - An independent government agency, responsible for the regulation of shipping in the foreign trades of the U.S.
Great Lakes St. Lawrence Seaway System - A wholly owned government corporation created by statute May 13, 1954, to construct, operate and maintain that part of the St. Lawrence Seaway between the Port of Montreal and Lake Erie, within the territorial limits of the United States. Intergovernmental Oceanographic Commission (IOC) - Oceanographic research, systematic ocean observations, technology development and transfer, and related education and training. 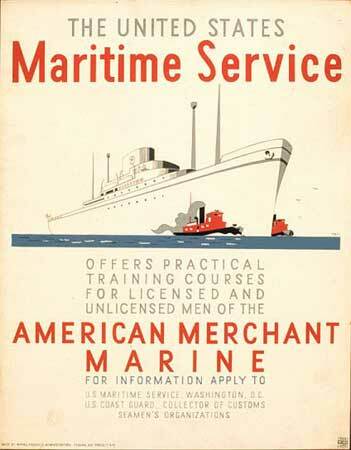 Maritime Administration (MARAD) - Promotes the U.S. merchant marine. 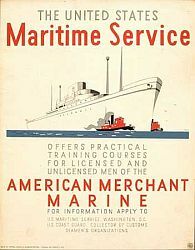 MARAD is responsible for developing and maintaining a merchant marine capable of meeting America's requirements for both commercial trade and national defense. National Marine Fisheries Service (NOAA Fisheries) - A division of the U.S. Department of Commerce, responsible for the stewardship of the nation's living marine resources and their habitat. National Transportation Safety Board (NTSB) - Charged by Congress with investigating every civil aviation accident in the U.S. and significant accidents in the other modes of transportation - railroad, highway, marine and pipeline - and issuing safety recommendations. Occupational Safety and Health Administration (OSHA) - The OSHA mission is to save lives, prevent injuries and protect the health of America's workers. Office of Naval Intelligence (ONI) - U.S. maritime intelligence. ONI employs civilian and military personnel around the world in support of operational commanders and war fighters; however, most employees work at the modern National Maritime Intelligence Center (NMIC) located just outside Washington, D.C. Surface Transportation Board - An independent adjudicatory body administratively housed within the Department of Transportation, responsible for the economic regulation of interstate surface transportation, primarily railroads, within the U.S.
U.S. Coast Guard Home Page (USCG) - The USCG is part of the Department of Transportation patrolling shores, saving lives, protecting property, enhancing the flow of commerce. U.S. Customs and Border Protection - Responsible for managing and establishing the policies, procedures and systems related to the processing of carriers, cargo/merchandise, and persons entering and departing the U.S. at ports of entry. U.S. Department of Transportation (DOT) - The DOT consists of the Office of the Secretary and eleven individual operating administrations: Bureau of Transportation Statistics, U.S. Coast Guard, the Federal Aviation Administration, the Federal Highway Administration, the Federal Railroad Administration, the Federal Transit Administration, the Maritime Administration, National Highway Traffic Safety Administration, the Research and Special Programs Administration, the Saint Lawrence Seaway Development Corporation, the Surface Transportation Board and the Transportation Administrative Services Center. U.S. International Trade Commission (USITC) - Provides trade expertise to the legislative and executive branches of government, determines the impact of imports on U.S. industries, and directs actions against certain unfair trade practices, such as patent, trademark, and copyright infringement. USITC also publishes the Harmonized Tariff Schedule of the U.S. Waterfront Commission of New York Harbor - Its mission is to investigate, deter, combat, and remedy criminal activity and influence in the Port of New York-New Jersey and to ensure fair hiring and employment practices. This webpage last updated on Saturday, October 29, 2016 7:03 AM.